Paper: large tea bag drawn on with a Sharpie. 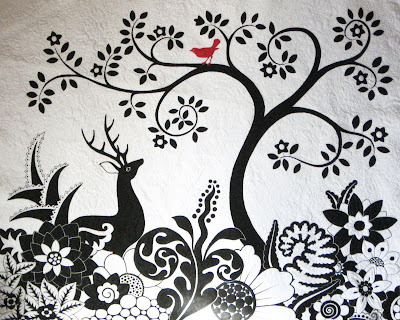 Cloth: cotton fabric painted with textile paints. Next I collaged more paper images that were scanned from copyright free image sources and a mini Tarot card from wrapping paper. I painted the artichoke by glazing layers of transparent textile paint over the drawing. Then I painted a thin coat of white paint over the flower area before glazing it with purple paint. I fused the finished collage to Peltex heavy weight interfacing and quilted the artichoke and a few leaves in the background. Metal: After trimming the finished collage, I lightly scored an outline on a sheet of craft metal. I measured an inch in from the inside of the scored outline, and cut out the center with an x-acto knife then trimmed the corners with scissors. I wrapped the edges of the metal to the back and smoothed it down flat with a bone folder. I finished the frame by drawing designs on the metal with a pointed tool made for working on craft metal. 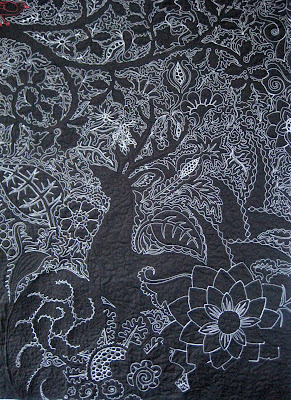 I bought the new free motion quilting foot for my Janome 6600 sewing machine while I was making this quilt. What prompted me to buy this new foot was some bobbin tension problems I was having with my machine. To try and solve my thread problem I called Superior threads and ordered King Tut Cotton. This was an overall improvement anyways because the heavier weight thread really made the quilting line have more definition. About this same time I came across Gloria Hanson’s blog post about Janome’s new free-motion quilting foot, Desperate, I thought I would try it out. Janomes FMQ foot is a two part purchase; the foot and another bobbin case with a tiny blue dot on it (to differentiate it from the regular bobbin case with a tiny red dot). Together it runs about $50. I tried out the new foot with the king Tut cotton and a top stitching needle and had my thread break about every 3 inches. Very frustrating! So I did another Google search and found that there is a Janome 6500 Yahoo group, I figured surely someone there would have an answer. I did a post search and found a couple people recommended a 90/14 quilting needle with this foot. I could not believe that changing my needle from a top stitch to a 90/14 could possibly solve the problem, but I was willing to try anything. I put a 90/14 in and stepped on the gas, lo and behold, it worked! What a dream. This FMQ foot is wonderful, even though it has a tiny closed loop it is not too hard to see when quilting. The best part about this foot is that it does NOT bounce up and down when stitching. So quilting feels very fluid and smooth, no grabby feeling on the fabric. 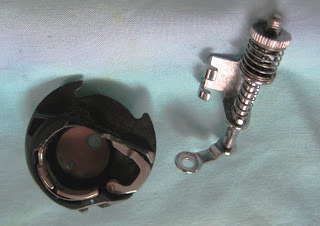 I think the real negative, is that you have to unscrew the throat plate to change the bobbin case every time you switch between free motion and other kinds of stitching. It is about three steps more than I want to do when working. I probably won’t switch it all out when doing small stuff where I go back and forth with different stitches a lot, but for free motion quilting a large quilt, it’s the best. I designed my label by taking parts of my original drawing and combining it with the quilt info in photoshop. 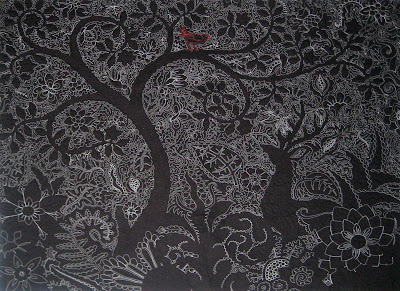 I printed the design out on paper and laid a piece of white fabric over it and traced it with a fine Prismacolor pen. I filled in the drawing with the Prismacolor pen and a Tee Juice marker from Jaquard. The Prismacolor pen makes a really fine line and is permanent on the fabric. 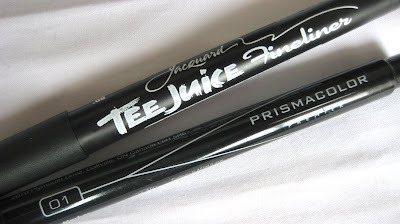 The Tee Juice marker has a fine point, but it is thicker than the .01 Prisma, and was good for filling in areas with a nice solid black. I know it would technically have been faster to print the label out on the fabric, but that would have been too easy. I went to the photographer yesterday and had the quilt shot, I had him photograph the back too. You can see my favorite binding technique is to do a faced binding on the back. I still have to do the label, but at least I now have a jpeg to send in with the show entry form. 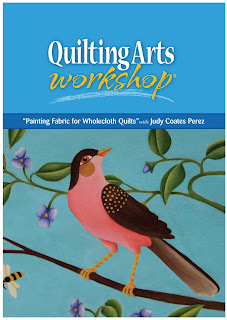 My workshop DVD Painting Fabric for Wholecloth Quilts is now for sale at Quilting Arts. This DVD gives information on using textile paints, mixing color, painting demonstrations for glazing, painting smooth gradations, details and more. When you buy the DVD you can also download a copy of this bird illustration that I paint during the workshop to try out some of the techniques on your own. 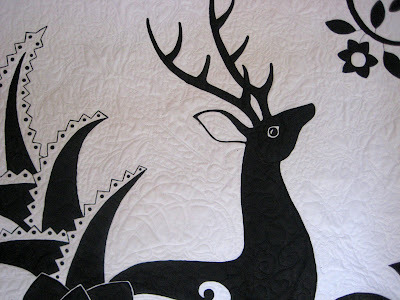 I am finally at the point when I feel comfortable showing the latest quilt. I sort of feel some strange superstition that if I show too much too soon, it will be doomed to failure. I never really know if it will come out how I want it to, until the very end. Sorry, the photo below is a little blurry, I will replace it with a better one soon. 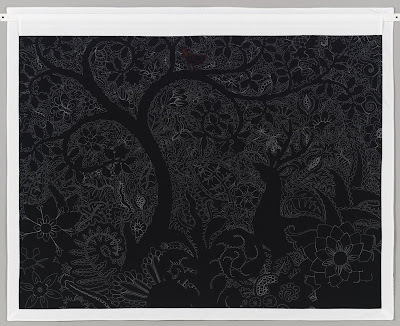 I really like the back of this quilt. 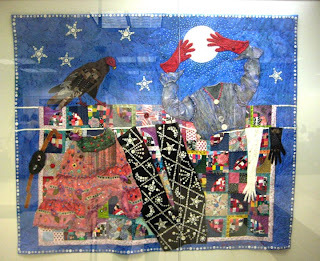 It shows off all the floral quilted imagery stitched into all the white areas of the quilt, that are only visible on the front with closer inspection. Now I am at the point of the dreaded handwork, sewing on the binding, the sleeve and the label. I began this quilt while I was creating my Color Theory Class. I think I spent so much time working with color, which I love, it was sort of a relief to work with none. 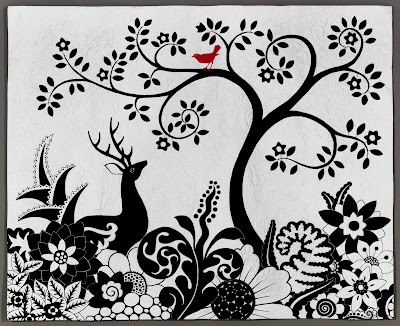 I loved working with this high contrast graphic black and white palette with just the little accent of red for the bird. 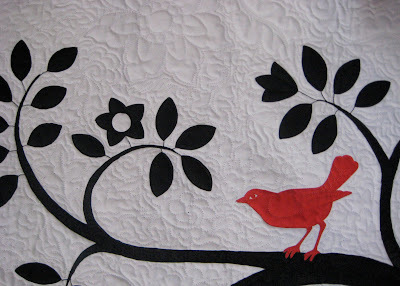 This is a whole cloth quilt painted with black and red textile paint on white fabric. 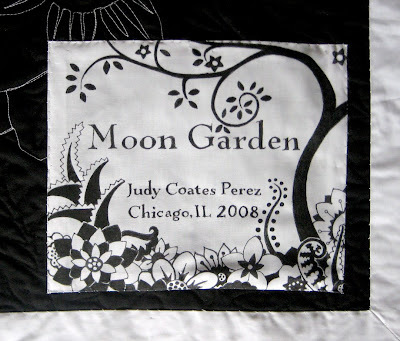 It is free-motion quilted with black, white and red thread. 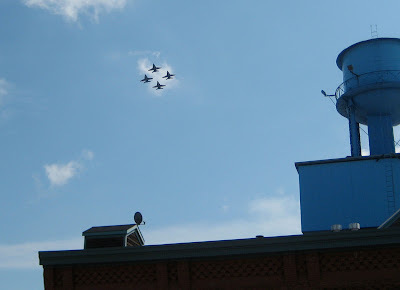 This weekend is the Air and Water show in Chicago. In preparation for the show Army and Navy jets do low flyovers in formation over our building on their way to the lake for two days of practice. It is really hard to photograph them because they are so fast, when you look where the sound is the planes have already long passed. It is amazing to see these jets flying sooooo close together at these speeds and so close to the skyscrapers. Sometimes they fly so low you can read the type on the underside of the wings and make out the shape of the pilots head. 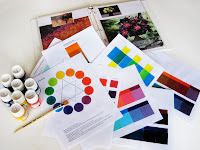 The next Color Theory Class is ready to go, it's a six week course beginning September 1st. To see the supply list, find out how to enroll and see what students from the last class had to say about it, click here. OK I have tried to avoid posting any political type stuff, but this is too cute. As I sat in the Atlanta airport Monday morning waiting for the thunderstorms in the mid-west to die down enough for my flight to take off, I happened to come across this fabulous little exhibit. 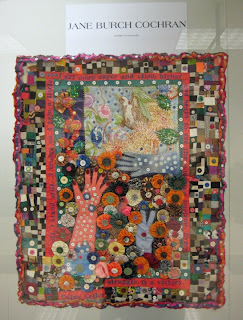 How cool to see a few Jane Burch Cochran quilts up close. That was a great distraction from the frustration of hearing that my flight had been delayed again. 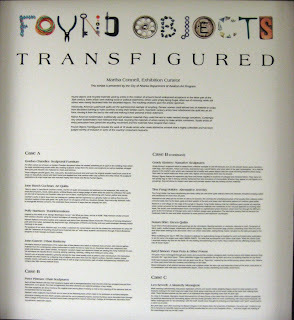 If you click on the Found Objects sign it should pop up large enough to see the other exhibitors. 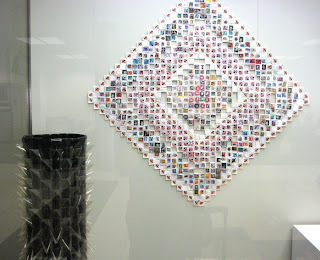 Unfortunately Lucky Shie's quilts were in another part of the airport, but there was a cool paper quilt made from postage stamps in a trip around the world pattern, as well as baskets made from camera negative film and soda cans. The second workshop in Atlanta was on using Tsukineko Inks, we worked through several techniques using the fantastic applicator pens and also using paint brushes with time spent gradating and blending colors smoothly. It is always interesting seeing people go through that learning curve from mild frustration to amazement once they have a few tips and techniques under their belt. The images on the right are some of my demos and examples I did during the class. 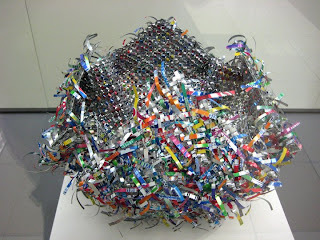 Be sure to visit Fiber on a Whim and Carol Sloan for more great workshop photos. These were my fabulous hosts, Kristin and Jan, from Fiber on a Whim. Don't let Kristin's youthful look fool you, she is definitely the boss in this mom and daughter partnership. It's just too bad they are both so darn serious. Their shop, in a lovely little gray house in Atlanta, is chock full of great supplies; paints, fabric, decorative papers, books and even a whole room full of gorgeous yarns. They have a great workspace downstairs with really comfortable chairs! I am so jealous there is no place like this here in Chicago. As we worked away downstairs we heard lots of laughter from above, these gals have too much fun! Everyone did beautiful work! I wish we could have kept going for a few more days and really gotten in some stitching and project construction with this. I hope everyone sends me photos! It was a real treat to meet Carol Sloan, who took my first online color theory class, then signed up for both days of workshops at Fiber on a Whim. Such faith, I am honored. 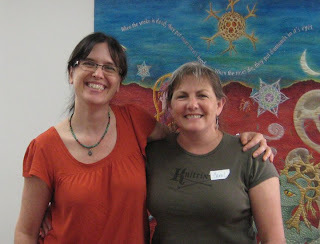 Be sure to head over to Carols blog, she has great photos from the workshops. The color theory class is just finishing up and I will announce the next one soon. I will probably start it just after Labor day, so be sure to check back in the coming weeks. Just to let you know, I will probably limit the class to 40 and at the moment I have a waiting list with over 20 people. I'll keep you posted.